Amsterdam is a beautiful city. 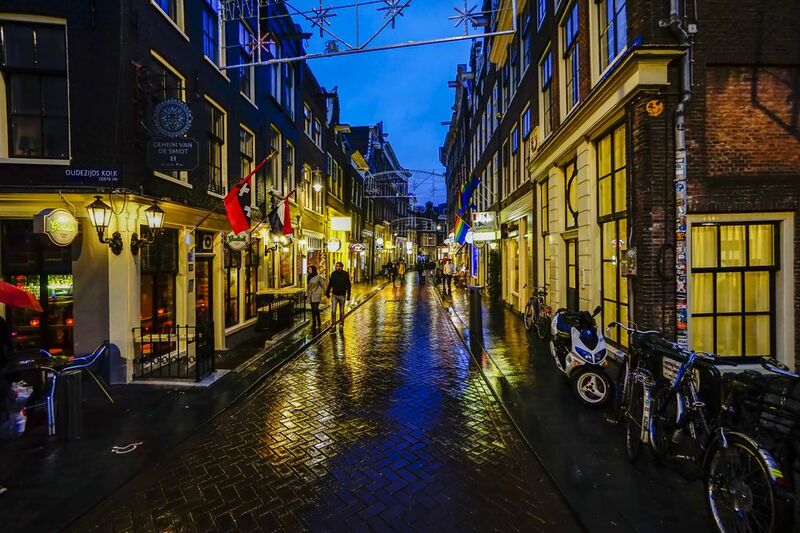 Though the Netherlands ​is known for its wet climate, a rainy day only makes the city all that more beautiful. Here's a list of some of the top places and things to do when the weather turns sour. Sure the trams offer a sheltered way to move throughout the city, but ride on a rainy day in Amsterdam and you'll be joined by thicker crowds of locals and visitors trying to keep dry, too. So why not make a wet day one to focus on getting to know one or two neighborhoods? This way you can pop in and out of shops, attractions and cafés within close range of each other. Consider the Eastern Canal Belt to hit several museums in stately canal houses, including Museum Van Loon, the Willet-Holthuysen Museum, the Museum of Bags and Purses (Tassenmuseum) and FOAM, a photography museum. The narrow alleys of the Jordaan are peppered with galleries and fantastically funky shops, and like De Pijp neighborhood, it's also littered with cozy cafés. Spending time inside museums seems like an obvious way to spend a rainy day in Amsterdam, but at the most popular ones, you're bound to find loads of other people with the same idea. Visiting museums like the Verzetsmuseum (Dutch Resistance Museum) and the Jewish Historical Museum, both of which are in the calmer Plantage neighborhood, might be a way to avoid shelter-seeking crowds. Also in the Plantage is Artis, Amsterdam's historical zoo. Many visitors may rule out this site on a rainy day, unaware that the grounds are also home to indoor fun at the planetarium, aquarium and butterfly pavilion. Whiling away a few hours in a brown café or eetcafé is an oh-so-Dutch must-do for Amsterdam visitors, no matter what the weather. But on days when the heavens have opened and puddles look more like mini lakes, the gezelligheid (a Dutch word that loosely translates to a friendly coziness) inside Amsterdam's cafés is even more irresistible. If the rain isn't too heavy and it's not blowing sideways (it happens), pick one with a covered café terrace, where you can dry out and watch as locals go on biking as if it's a sunny day. No one likes to try on a new dress when drenched. But some of Amsterdam's best shopping choices are ideal for rainy-day wallet-damage. Bijenkorf, a five-level higher-end department store on Dam Square, can keep even the most efficient shopaholic busy for a few hours. Nearby Magna Plaza, in a stunning neo-Gothic building, comprises several popular clothing stores like Laundry Industry and Mango. Feel robbed because you missed Amsterdam's open-air markets? Opt for indoor flea market Looier in the Jordaan, where dozens of stalls boast antique jewelry, collector's items, furniture and the usual favorite lost treasures. Prefer finer pieces of history? Dodge the rain door-to-door in the Spiegelkwartier, Amsterdam's fine arts and antiques hub. Tuschinski: The striking 1920s Art Deco facade, foyer and original auditoriums (pictured) lend a chic feel to mainstream titles. Het Ketelhuis: Showing art-house flicks, documentaries and cult favorites, the building is part of the Westergasfabriek restored old gasworks area. The Movies: The Netherlands' oldest operating cinema (since 1912) is a perfect dinner-and-a-movie spot with its adjacent restaurant. Many showings have an intermission for enjoying libations in the Art Deco bar.